Being a person who has always marched to my own drums, made choices on who and what I chose to be around, I found a family at FreedomWorks. There, I have been a long time member and have met great people like Matt Kibbe, Adam Brandon and his crew. One day while reading the FreedomWorks newsletter, I was thrilled to find they had a supporting group of artists. The group's name is Liberatchik. As it turns out, Liberatchik is a group of libertarian and conservative artists with the same ideals and goals as mine. I contacted Frances Byrd, their highly energetic National Director, and she welcomed me into the group. Being a self-taught artist, I have never been associated with any artists’ group. Prior to finding a second home with all of the artists and good people associated with Liberatchik, I never thought the two words "conservative" and "artist" could be used together! My stained Glass pictures are mostly non-political, but sometimes carry a subliminal message that one has to look hard to find. My eyes are closely fixed on God's beauty in nature. I don't very often include man-made structures in my glass but on occasion I do. For the most part I don't like to produce the usual stained glass geometric shapes. In the natural world you will not see diminishing lines going to the edge of a picture, nor will you find those lines in my art. I also try to bring a three-dimensional look to a two-dimensional plane along with my signature symbol, my entire name spelled inside a circle, within the glass. Working above and below the flat picture aids in accomplishing all the beauty of texture, flow and depth I try to depict in my art. The window frames and hardware are salvaged from old homes in the Mid-Atlantic and New England areas, then repurposed in the form of art. Richard's stained glass masterpieces revive a lost art and ground the viewer in the beauty of the natural world, reminding us poignantly of what has been destroyed by the art elites in their ever more vulgar pursuit of aesthetic vomit. His windows have more recently begun to include a political or social message that convey a subtle ideal within the visual composition, proving that one does not have to beat the viewer over the head with an overtly political message to change the culture. Although, in the last few weeks current events have brought out his snarky side, Richard has created some more obvious pieces including shell casings in the composition. 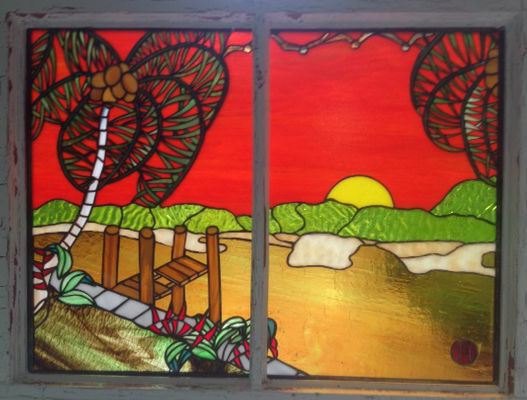 Learn more about Richard’s beautiful stained glass windows and fish, as well as, new conceptual pieces on his gallery page at Liberatchik, and join us in our efforts to #TakeBackOurCulture !